| Great fun, great casting, great music. I saw older versions of the movie and also the play (in both pre-Broadway and Broadway versions). As great as they all were, this 2007 movie was even better! The audience in my movie house certainly seemed to agree. Virtually everyone in the theatre applauded when the movie was over (unusual here in subdued Seattle)and about a dozen people actually gave the moving a STANDING ovation (I can't recall seeing that here). I would highlight a specific performer, but it would be very difficult since they were all terrific, from the leads to the smaller role players. The music was sensational (I wanted to buy a CD, but the theatre said they had sold out), and there wasn't a dull minute in the movie. 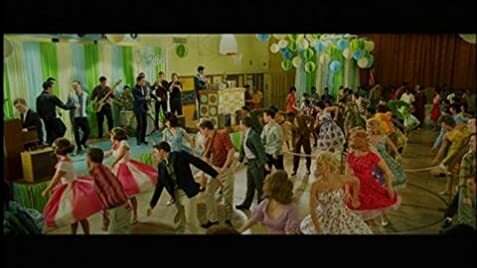 I'd put this movie right up there (and in my opinion a bit ahead) of other "classics" of this genre like "Grease,""Bye Bye Birdie" and the more recent "Chicago" and "Dreamgirls" (all of which I thought were excellent). We went with 2 other couples, the men of which told me they "hated musicals," but they loved this picture and they actually raved about it the rest of the evening. I'd really worry about someone who didn't enjoy and have fun at this "Hairspray!" I'm serious!! To facilitate filming for the "Run and Tell That" dance number, the production cut up a 1957 GMC transit bus. According to the DVD commentary, it was cut into 6 pieces. The bus wasn't really moving; that part was filmed in a soundstage. At the start of "Good Morning Baltimore," Tracy's alarm clock changes position three times. Starting in August, in select theaters, a sing-along version of the film with on-screen lyrics was released.